She talks out loud when doing math…just like me. I have had the opportunity to help Julia with her math homework this week. (Ok, I’m tired of the aliases I came up with when I started blogging so the real names are coming out…as if anyone who reads this doesn’t know my kids’ and hub’s names.) I must say, that I am quite impressed with what I have actually managed to retain over the past 20 plus years since I was in 4th grade. This week’s work focused on dividing double digit numbers. (Now, for those of you “math” people out there, I am sure there is some other “math” term for this…but if you know me, I am NOT a math person. NOT. AT. ALL. I think I even impressed Julia with my math teachings. Frank (yep, that’s his name) was a bit leery to let me take a crack at the homework- but the fact that she came back for more on night two really speaks volumes I think? BUT, it wasn’t my savvy math skills that have really stuck with me after my week of diving back into my role as a teacher, but it was watching her work out her math problems. I mean REALLY WATCHING- like with your eyes and your brain- you know what I’m talking about? I don’t remember a lot these days. (That is another whole blog entry that dawned on me tonight…and I will have to start writing this as soon as I am done here because I will forget otherwise.) Crap, where was I? 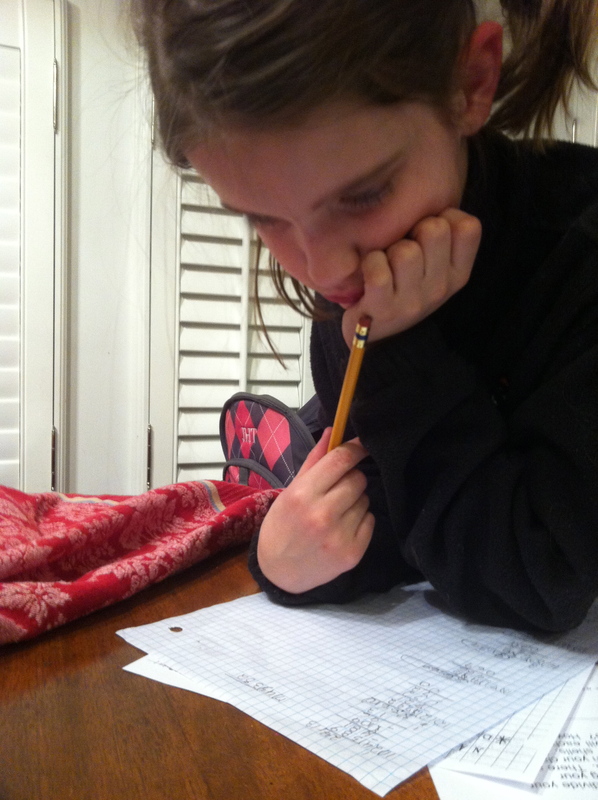 Homework, math, my superb teaching skills….MATH! Ok, so while Julia works out her math problems- she talks it out! Literally, she is talking the whole time…I DID THAT, I DO THAT!!! SHE GOT THAT FROM MEEEEEEEEEEE!!!! She also likes to stand up when she does her homework. I think it makes her feel in control of it-I am down with that too.